Hawaiian Pizza Grilled Cheese is my favorite Grilled Cheese Recipe for busy days and nights. 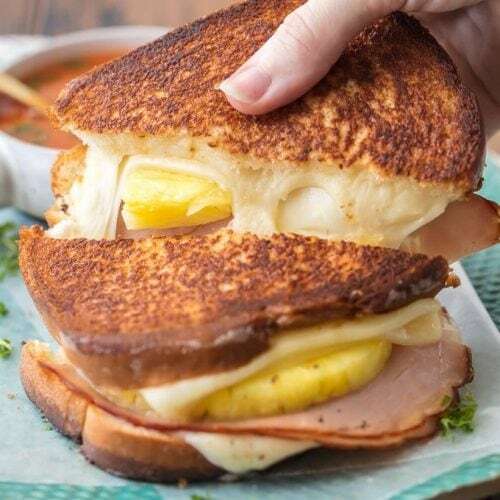 Tips and tricks for how to make the PERFECT Grilled Cheese included in this delicious sandwich loaded with cheese, ham, and pineapple. This Pizza Grilled Cheese is a delicious twist on a classic recipe loved by both kids and adults! Spread mayo over the outside of each piece of bread. Spread honey mustard on the inside of each piece of bread. Heat a nonstick skillet over medium/low heat. Add ½ tablespoon butter. A soon as the butter melts fully, add your first piece of bread, mayo side down. Top the bread with 1 slice of cheese, then ham, then cheese, then pineapple, then final slice cheese. Top with remaining piece of bread, mayo side up. Allow to cook undisturbed for 3-4 minutes or until the cheese begins to melt and the bread is fully toasted on the bottom. Use a large spatula to lift the sandwich off the skillet and toss in the remaining ½ tablespoon butter. Allow to melt then flip the sandwich to allow the second side to toast. Grill for 3-4 more minutes, watching to make sure you don’t burn the bread.